Google continues to push its tentacles deeper into the hardware market on a number of different fronts, including smart home devices, home networking, laptops and of course smartphones. The Pixel 2 was in many ways a great success for the firm, and marked it out as a leader in high-end smartphone manufacturing. The Pixel 3 aims to build on that success. But how does it perform? I’ve been trying out the larger version – the Pixel 3 XL to find out. In many ways the Pixel 3 XL looks a lot like all the other handsets in the same premium market segment. Its screen covers most but not all of the front of the display, with a small bezel on the bottom where the microphone is and a notch at the top where the front-facing camera and speaker are placed. The notch isn’t that big, but like on the iPhone X range it does detract from the full-screen experience. If you really don’t like it, look to the smaller Pixel 3, because it doesn’t have one. The edges of the display aren’t curved in the same way as those on the Samsung Galaxy S9 or Sony Xperia XZ3. They are, however, rounded which make the phone comfortable to hold. The volume control button is situated on the right side, below the power button. There is something about the layout of this which I found a little annoying – every time I tried to reach for the on/off switch with my thumb I seemed to be only able to reach the volume rocker. Nevertheless, it won’t be a big deal for most, and again it is probably not an issue at all on the smaller Pixel 3. Google has done something wonderful on the rear of the device. It has resisted the temptation to place the main camera lens in the middle, above the fingerprint reader, like so many other manufacturers have. Instead the lens is offset to the left, with the fingerprint sensor in the centre line. That means you are far less likely to smudge the lens with a digit. The entire front and back of the device is made of Corning Gorilla Glass. 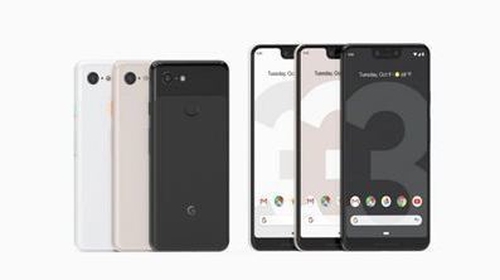 On the rear the top fifth has a shiny glass finish, with a grey matte finish covering the bottom four fifths – the same two-tone concept as found on the Pixel 2. All told, the phone looks good – although it does lack a little bit of a wow factor. The screen on the Pixel 3 XL is 6.3", compared to 5.5" on the Pixel 3. Screen quality differs between the two devices also, with the Pixel 3 sporting a FHD+ flexible OLED at 443 ppi and the Pixel 3 a QHD+ OLED at 523ppi. We can’t vouch for the Pixel 3 as we didn’t get to try it, but the display on the Pixel 3 XL is very good indeed. In all circumstances we used it in, the screen output was clear, bright and well-defined. It has a contrast ratio of 100,000:1and a 16.77 million colour range. Those numbers sound impressive and the reality in practical terms is too. The smartphone is certified as a Premium HDR device, which means it meets standards for colour accuracy and display brightness. There are a number of different preset colour modes, with "Adaptive" the default. It is designed to provide natural colour replication preferred by most people, but there are also "Natural" and "Boosted" modes. Pixel 3 XL is also a YouTube Signature Device, which means it is able to provide the best possible YouTube experience Google says. The lock-screen also features an always-on display which can be set to remain on all the time, or come on with a double tap or a lift. The overall experience then is a great one – good enough to rival anything else in the class. Google has resisted the temptation to go down the route of adding a second or even a third camera to the Pixel. The main camera on the device is a 12.2MP sensor with a f/1.8 aperture. So far so uninspiring, you might say. But it is not the basic image, rather how it is processed after capture that makes the Pixel 3 XL special. For starters, the camera comes with HDR+ on by default. That means the camera will capture up to 8 frames and merge them together for excellent photos in any light conditions. The visual-core chip and machine learning software also combine to boost the final product. Included in the set-up are a number of clever features too, including Top Shot, which uses machine learning to identify and recommend the best shot from a moment you’ve captured, ignoring those with blur or bad focus. Photobooth mode allows a selfie to be captured automatically on the dual front 8MP cameras using just a smile. While Group Selfie mode will utilise the wide angle front facing lens to get everyone in, with the processor removing the fish-eye warp found on many group selfie shots. Google Lens, which uses AI to identify objects, text etc and then provide information on them, is also built into the camera app. On the video front, the main camera shoots up to 4K resolution at 30fps, with the front camera capturing up to 1080p at the same frame rate. In a world of smartphones with overly complicated camera interfaces, the app on the Pixel 3 XL is also refreshingly straightforward to navigate. Sure, if you want to, there’s plenty of opportunity to make manual adjustments and delve deeper. But the essence of the Pixel 3 camera set-up is essentially simplicity and consistency. And it does both well. The latest Qualcomm Snapdragon 845 processor is what’s driving the Pixel 3 XL, and that coupled with 4GB of RAM leaves it more than adequately powered. There’s also the dedicated Visual Core chip to boost imaging performance. In the memory department you’ll find either 64GB or 128GB of storage built-in. This could be a big deal for some people, because as other smartphone manufacturers move to offering up to 512GB of native storage, the Pixel 3 offering looks a little meagre. And, wait for it, there’s no microSD card slot.....which is rather strange. The pay-off though is that Google is offering unlimited free storage on Google Photos for Pixel 3 users until 2022. To stop the smartphone from maxing out on memory, you can also set up the device to automatically delete any pictures that are a certain age and have already been backed up to Google Photos. What it lacks in memory it makes up for in audio though, with dual front-firing stereo speakers that pack a reasonable punch. There’s no 3.5mm audio jack though – it is Bluetooth or USB-C all the way, although there is an adapter and earbuds in the box. The battery on the Pixel 3 XL is a decent sized 3430mAH which should give you a full day’s use. It’s also better than the 2915mAh power pack on the smaller Pixel 3, which is a little underwhelming, offering enough to get you through the day, but not if you are a hard user. The use of glass on the rear does mean though that both Pixel 3 and Pixel 3 XL do now support wireless charging – a welcome addition. Google has also developed the optional extra Pixel Stand – a wireless charging stand that charges at up to 10W, less than the 18W offered by the plug-in charger, but reasonable nonetheless. It also works with the phone to make the handset useful while charging by including personalised alerts, ambient screen features, etc. You can also use the device as a photo frame when it is sitting on the charger. There are a myriad of other gizmos on the Pixel XL 3. Chief among them is a suite of digital wellbeing controls, like a dashboard that breaks down your usage in granular detail. You can also set daily app timers for individual applications and turn on a do not disturb feature which mutes everything including visual notifications. The Wind Down feature also reminds you to switch off at night. On the phone front the Duo integration lets you initiate a video call right from the dialer or contacts list. Google Assistant is everywhere, as you’d expect, and you can launch it by squeezing the Active Edge – the sides of the device in the bottom third. There’s also an Assistant feature that lets you screen your calls before you answer them, by producing a transcript of responses from the caller to certain questions like who is calling, why, etc. I also liked the Now Playing feature which automatically tells you what music is playing in the background (not on the phone itself) on the lock screen. The user interface is straightforward and easy to navigate, running Android 9 Pie with new gesture navigation features, although there’s a bit too much bloatware preloaded for my liking. There’s an awful lot to like about the Pixel 3 XL. There are a couple of niggles, like the limited storage options, the battery life on the smaller Pixel 3 could be more generous and the design is a little "meh". But the camera is exceptional for a single lens model (although it does make you wonder how good it would be with a dual camera), the device is packed with loads of other clever and useful AI assisted features and the display is excellent. The Pixel 3 is priced at €899 for the 64GB version and €959 for the 128GB option. While the larger Pixel 3 XL will cost you €999 for the 64 GB version and €1099 for the 128GB version. That puts the device broadly on a par in cost terms then with the latest iPhone Xs/Max and Samsung Galaxy S9 devices. Are you getting the same bang for your buck in the Pixel 3? That will be a matter of debate. What’s clear though is that the smartphone will continue to boost Google’s credentials in the hardware space.